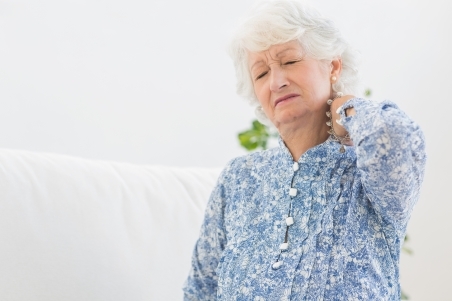 Polymyalgia rheumatica (PMR) is a condition that causes inflammation, pain and stiffness in your shoulders, neck, and hips. We don't know what causes PMR, but it mainly affects people over 60. Some people with PMR develop a more serious condition called giant cell arteritis (GCA). sometimes, other general symptoms such as tiredness, weight loss, fever, and loss of appetite. If you're worried about any of these symptoms, make an appointment with your GP. If your symptoms include a sudden headache, tenderness around your scalp, or loss of vision, see your doctor as soon as possible. These are signs of GCA. Your doctor will ask you about your symptoms and how long you've had them. They'll want to make sure you don't have GCA, and will want to rule out other health conditions, such as fibromyalgia and osteoarthritis. There's no single test to diagnose PMR, but your doctor will want you to have some blood tests to look for inflammation in your body. They'll usually make a diagnosis based on your symptoms combined with your blood test results. If your doctor is unsure about a diagnosis, especially if you're younger than 50, they may refer you to see a rheumatologist at Christchurch Hospital, as you may need more tests. If your doctor diagnoses you with PMR, they'll start you on a steroid medication called prednisone straight away. The medication works by reducing your inflammation, and you should see an improvement within a few days. Your doctor will monitor your progress to check if your symptoms are improving, and to adjust the dose if necessary. You usually start taking 15 to 20 mg of prednisone daily and stay at this dose for at least a month. When your symptoms improve, your doctor will gradually reduce the dosage. Often people need to keep taking a low dose of prednisone for several years to stop the PMR from coming back. An information sheet about PMR, including what you can do to cope with it. A short brochure about PMR, including its symptoms and treatment options. More detailed information about PMR and GCA. BPAC – Polymyalgia rheumatica: Look before you leap, retrieved April 2017.